There are a number of ways in which you can lower your monthly energy bill at Farmers’ Electric Cooperative. The most efficient way to begin this process is by contacting Joe Hardie at Farmers' Electric and scheduling an energy review for your home. Home energy reviews, which are a thorough examination of a residence that reveals where energy efficiency weaknesses exist, are offered to Cooperative Members at a discounted price. Members may also take advantage of the Cooperative’s Incentive Program, which returns up to $500 back to the Member. 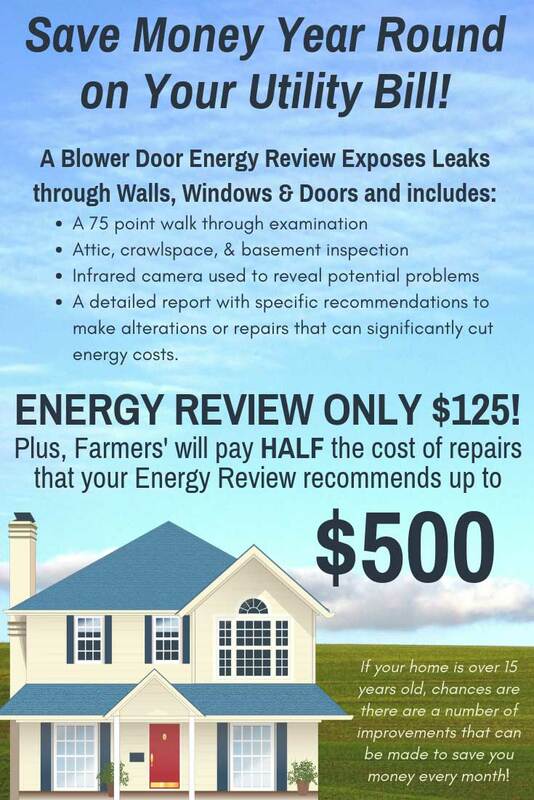 A Blower Door energy review is a complete review of the home. A walk-through survey and the use of a blower door will locate areas in the home where there is air infiltration. A computer report is generated for the Member to providing specific recommendations for improving the efficiency of the home. If weather conditions are adequate, a thermal imaging camera can be used to locate areas in the house where heat is being lost. The energy review is offered to Members for $125. However, half of any expenses the Member incurs completing the recommendations will be reimbursed up to a maximum refund of $500! What a deal! Call Joe Hardie at Farmers' Electric, at 660-646-4281 or 1-800-279-0496, ext. 122, today!